Last year saw a nearly unique sporting event in Australia. For only the second time in its 113 year history, the Australian Rules football grand final ended in a draw. This is so rare simply because the rules of the game are such that high scores are the norm. This game ended with 68 points all, but scores above 100 points are by no means uncommon. Since draws are rare, the game has no provision for extra time or other means of resolving a draw. Except for one: a rematch. That’s what happened with this match. The two battered teams dragged themselves back to the oval a week later and a conclusive result was reached. 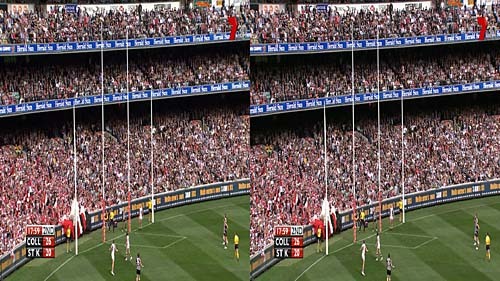 The drawn game was special for another reason: it was broadcast in 3D, the first time for an Australian Rules Grand Final match. The broadcast was in limited areas on a trial basis authorised by the government, and it used the side-by-side format. The following week’s repeat did not receive the same treatment, presumably because no contingent bookings had been made for the special equipment. Last week The 3D Movie List tweeted that this drawn match was being released on Blu-ray 3D by the Visual Entertainment Group, a local Australian DVD distributor that specialises in a number of niches, including sports. I contacted them and they kindly sent me a copy. I was intrigued how this was going to be done. Blu-ray 3D employs the MPEG4 Multiview Video Coding format to produce a frame packed (ie. doubled, with images for both left and right eyes) 24 fps output. But this was shot in 1080i50 and broadcast in that format, using the side-by-side arrangement for the frames. Converting to 24fps was always going to be difficult. But the disc turned out not to be ‘Blu-ray 3D’ as I understand it, but the same 1080i50 side-by-side format. It used the MPEG4 AVC codec (as did the TV broadcast), but at the enormously higher average bitrate of about 32Mbps. Incidentally, you get three different game calls to choose from from three different broadcasters (one TV, and two radio it seems). Don’t get me wrong. This disc looks good and produces a good 3D effect, and there is no other satisfactory way of presenting it in 3D, but is it really, technically, ‘Blu-ray 3D’? This entry was posted in 3D, Blu-ray, HDTV. Bookmark the permalink. 4 Responses to What is Blu-ray 3D? 3D-blu-ray does indeed allow higher frame rates suited to sport etc. They are 720p/50 and 720p/59.94. 1080p/24 is not the only 3D blu-ray spec. allowed. 1080i in (proper spec) blu-ray 3D is not allowed. This disc is effectively 2D side-by-side, with the user expected to select the correct mode on their 3D TV themselves. So, this disc *COULD* have been authored correctly by cross converting the 1080i Side-By-Side format into frame-packed 720p/50, maintaining the smooth-video look needed for sport. Indeed, the Side-By-Side format is simply a broadcast format, and this match would most likely have full res (1080 x 1920 x 2) HD-CAM SR dual-stream 4:2:2 masters recorded by the Outside Broadcast van on-site. This master would be used to create the 3D 720p/50 blu-ray, if done properly. This was the third draw: 1948 Melbourne vs. Essendon & 1977 North Melbourne vs. Collingwood were the first two.